This is a very useful and versatile circuit. In many circuits a speaker is used as a microphone for example in intercoms, one ways telephones or as an emergency microphone in these types of circuits speaker needs amplification to increase the speaker's output power. This circuit can be built easily with the junk box parts with any general purpose transistor. The circuit uses pnp transistor but you can also use npn transistor all you have to do is reverse the polarity of battery and capacitor 1. 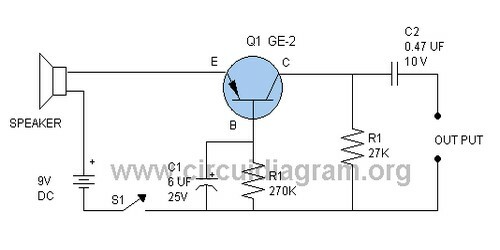 Transistor used in this circuit is a common base amp which is providing a low impedance input to match with low impedance speaker from 3 to 16 ohms.